"Words cannot adequately express the experience of staying here. The view, the house, the garden, the walk in the forest?we would want to come back her again and again. This place is like a dream come alive!" 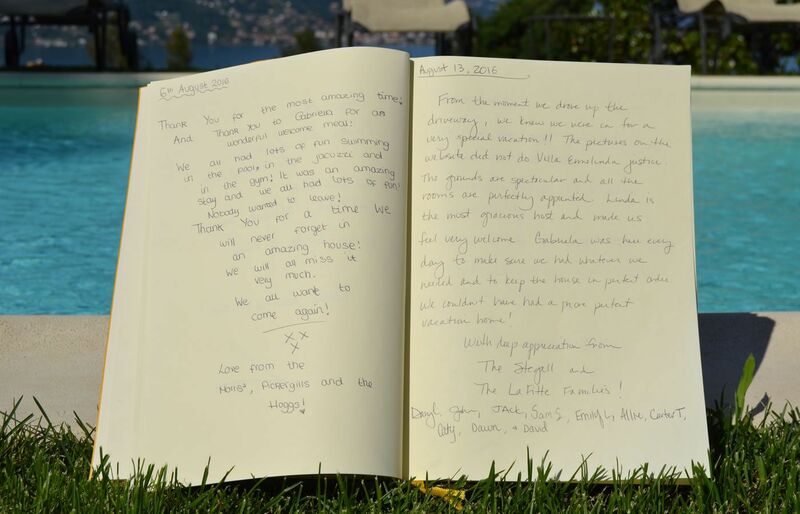 "Thank you for sharing Villa Ermelinda with us all. We enjoyed the wonderful view over the lake and mountains, the stiff walks down to (and up from) the village and the refreshing dips in the pool! The villa is a beautiful and tranquil retreat and we have had a magical holiday that will stay with us forever." "Thank you, we enjoyed the week very much. Tolles Haus, toller Ausblick. Wir hatten viel Spass un kommen wieder!" "Thank you for the most amazing time! And thank you to Gabriella for a wonderful welcome meal. We all had lots of fun swimming in the pool, in the Jacuzzi and in the gym. It was an amazing stay and we all had a lot of fun. Nobody wanted to leave! Thank you for a time we will never forget in an amazing house! We will all miss it very much. We all want to come again." "From the moment we drove up the driveway, we knew we were in for a very special vacation! The pictures on the website did not do Villa Ermelinda justice. The grounds are spectacular and all the rooms are perfectly appointed. Linda is the most gracious host and made us feel very welcome. Gabriella was here every day, to make sure we had whatever we needed and to keep the house in perfect order. We wouldn't have had a more perfect vacation home!" "Fabulous vacation, fabulous place, breathtaking views. Linda, mille grazie per la tua accoglienza." "Quelle belle maison, superbe location, vue imprenable! Nous avons ador?! Nous reviendrons certainement!" PS: we loved Gabriella and the other girls"
"Dear Linda and family, we have spent many vacations in houses/homes in many parts of the world. I have to say this is the best we have ever been. It is thoughtfully laid out; every detail is thought through, beautifully appointed with the best quality. We felt totally at home here. I just hope that with four young children we have not inflected undue ware and tear to your beautiful home. Gabriella and Martinella are much great cook and homekeepers. They have made our living easy. We thank them dearly. I cannot close without mentioning the beautiful setting of your house. I spent many evening enjoying the ever changing lights of the mountains and the lake! Thanks a million." "What an absolutely wonderful place for our stay in Baveno. Everything was perfect and every detail attended to. I enjoyed every minute here and hope to return with friends and family in the future. Thank you so very much."